Distributor: Currently licensed by Sentai Filmworks, but also available streaming on crunchyroll. Also Recommended: Blue Spring Ride; Say "I Love You"
Notes: Based on a manga series by Matcha Hazuki, serialized in Square Enix's Gangan Joker. 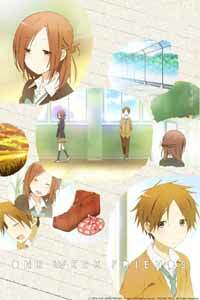 Yuki Hase very much wants to be friends with classmate Kaori Fujimiya, but Kaori avoids making friends with anybody. He's a persistent fellow, however, and willing to do whatever it takes to overcome her reservations. I also wished that there had been more genuine humor in the show. Shogo had a few jabs that benefitted from his (perpetually) deadpan delivery. I know that in the abstract Saki's antics are supposed to be funny, but I developed a rather Queen Victoria-ish "we are not amused" attitude toward her that I couldn't shake, and I DID try, believe me.